To assist CAMWS in making its organization and annual meeting best serve the needs of its graduate students. The CAMWS Annual Meeting is well known for providing a comfortable and supportive atmosphere that has helped many young scholars to present their first academic papers. The Graduate Student Issues Committee, made up of several graduate student members of CAMWS, strives to build on the positive role the organization plays in students' nascent professional lives by making the CAMWS annual meetings even more accessible, welcoming, and productive. Most notably, the committee at each annual meeting hosts a student reception and designs a special panel to address students' professional concerns. Follow the links below to learn more about GSIC and, if you're not a CAMWS member, to read more reasons why you should be. This website is maintained by members of GSIC. 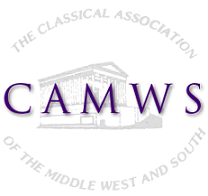 Postings are not necessarily endorsed by the CAMWS organization, and the CAMWS organization reserves the right not to post or to remove postings which it considers inappropriate for any reason.